The Earth's moon is thought to have formed when a Mars-sized object, called Theia, slammed into the early Earth 4.5 billion years ago, blasting out material that later coalesced in to a large satellite as depicted in this artist's illustration. A new analysis of lunar rocks adds new support to this Giant Impact Hypothesis. A new analysis of lunar rocks now supports the idea that the moon was born in a gigantic collision between the nascent Earth and a mysterious planet-size rock, scientists say. Earth formed about 4.5 billion years ago, and scientists think the moon came into being shortly afterward. The prevailing explanation for the moon's origin, known as the Giant Impact Hypothesis, is that it resulted from two protoplanets (or embryonic worlds) that slammed together — the Earth as it was forming, and a Mars-size object called Theia. A lot of debris went on to form the moon. 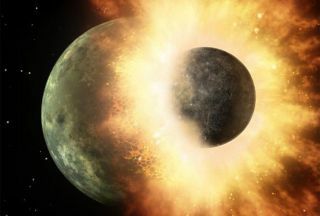 For instance, such a collision might help explain why the moon is low in substances that evaporate fairly easily, such as water — these volatile materials escaped in the heat of the impact's aftermath, Herwartz explained. "The reports of tiny amounts of water on the moon that now come up here and there do not change that view," Herwartz said. "Compared to the blue planet Earth, the moon is still bone dry — in fact, there is far more water in bones than in the moon." "This was a big puzzle," Herwartz told Space.com. Now, for the first time, Herwartz and his colleagues have found differences in the isotopic makeup of Earth and the moon — findings that support the Giant Impact Hypothesis for how the moon formed. The researchers focused on ratios between two different isotopes of oxygen — oxygen-16, which has eight neutrons in its nucleus, and oxygen-17, which has nine. Oxygen isotope ratios can vary greatly from planet to planet. Initially, the scientists looked at lunar rocks that were blasted off the moon by cosmic impacts and landed on Earth as meteorites. However, these samples were contaminated by the oxygen isotopes in water from Earth. Instead, Herwartz and his colleagues looked at lunar rocks provided by NASA that were collected by astronauts during the Apollo 11, 12 and 16 missions. The researchers discovered that these rocks contained slightly more oxygen-17 than oxygen-16 — but a statistically significant amount more — when compared to Earth rocks. The moon rock shown here is an example of a lunar breccia, a rock that is composed of other rock fragments. Meteorite impacts on the moon are the main source of rock fragmentation on the lunar surface. Image released June 5, 2014. "The differences are small and difficult to detect, but they are there," Herwartz said. "We now get an idea of the composition of Theia." The new data suggest that the moon may be made up of about 40 percent Theia. The investigators proposed that Theia was similar to meteorites known as enstatite chondrites. "This group of meteorites has a very, very similar isotopic composition to the Earth," Herwartz said. "Such a composition of Theia would explain why no isotopic differences for oxygen or any other isotope system had been detected to date." Future research can look for differences between the moon and Earth when it comes to other isotopes, such as those of titanium. Scientists could also investigate another possible explanation for these new findings — for instance, that a veneer of material low in oxygen-17, such as meteorites known as carbonaceous chondrites, accreted onto Earth after the moon formed, Herwartz said. Pictured here is the moon meteorite Kalahari 008. Meteorite impacts on the moon can eject lunar material that then falls to Earth as a lunar meteorite. Kalahari 008 is a 600-gram lunar meteorite collected in 1999 in Botswana's Kalahari Desert. The scientists will detail their findings in the June 6 issue of the journal Science and on June 11 at the Goldschmidt geochemistry conference in California.